Leadership, reduced bureaucracy and sharing risk are among the key ingredients to successful commissioning, according to a new report. 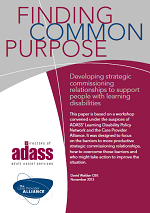 The paper, Finding Common Purpose, developing strategic commissioning relationships to support people with learning disabilities, outlines the challenges - and potential solutions – to productive strategic commissioning. It is published by the Association of Directors of Adult Social Services and the Care Provider Alliance and is based on a recent workshop held by the two organisations. • Trust – providers say council budget cuts create inconsistency in commissioning and increase central procurement directorates but councils suggest providers fail to appreciate the financial pressures they face. But the report emphasises that it is not too late to design and adopt an approach to commissioning that safeguards the best of current approaches and avoids the “short-term, adversarial relationships that can harm valuable services – and the people who depend on them”. • On the issue of sharing risk, use effective dialogue to focus on the outcomes sought rather than process.